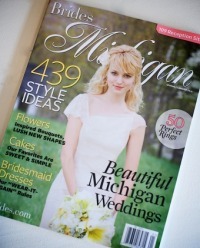 BRIDES: WANT A FREE COPY OF BRIDES MAGAZINE? So, here's the deal: If you're a bride-to-be, or if you know a bride-to-be, and you'd like to get your hands on a copy of this magazine, all you have to do is post a comment on this blog post (or facebook post if you're reading it there). Edit to add: I'm going to keep accepting comments on this until Friday - then I'll randomly draw people to get a free copy! I'll contact the winners by email, and post the results here - so be sure to check back tomorrow!